Luxury, expertise, and experience: Few brands can rival Cartier when it comes to their perfect creations. The watch company has been a watchmaking pioneer for over 150 years. One of the first pilot's watches came from this Parisian manufacturer. The French company Cartier is famous for their fine jewelry, luxurious accessories, and elegant watches. The manufacturer is considered one of the pioneers of the craft. 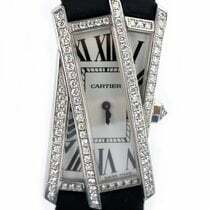 Cartier was one of the first companies to offer wristwatches at a time when pocket watches were still the dominant trend. Cartier has set design standards, too. At the beginning of the 20th century, the Parisian manufacturer introduced the first square dial. The Santos, which was developed in 1904 especially for the Brazilian pilot Alberto Santos Dumont, is today one of Cartier's most famous wristwatches. The same can be said of the Tank, another square timepiece which has been around since 1917. Over the decades, it's become an iconic design and has attracted a number of prominent wearers, including Andy Warhol, Elton John, Jacques Chirac, Calvin Klein, and Yves Saint Laurent. 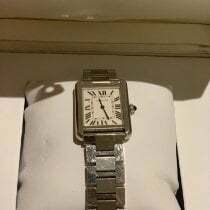 Owners of Cartier watches always have a story to tell, not least of all thanks to the special attention to detail the manufacturer puts into every product and the versatility of their range. For example, the Roadster collection brings to mind old sports cars, while the decorative Panthère embodies the elegance of the eponymous feline. How much does a Cartier watch cost? Lovers of elaborately decorated watches will get their money's worth with a Cartier timepiece. If you like the style of a square or rectangular watch, then have a look at the Santos collection. A pre-owned Santos in good condition can be bought for less than 1,200 USD. New pieces cost around 4,100 USD. Models with 18-karat gold cases and diamond-set bezels cost over 35,000 USD. The Santos 100, made in celebration of Santos's 100th birthday, costs 2,900 USD pre-owned in good condition; new, it starts at 4,700 USD. 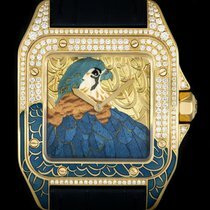 However, the version with a tourbillon and diamonds costs over 233,000 USD. The Tank is also square shaped. Pre-owned quartz models are available for around 820 USD. New, they cost much more, running about 2,300 USD. This series includes models that cost well over 58,000 USD as well. 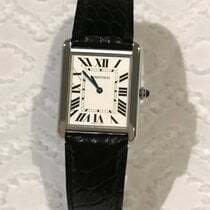 For example, prices for a Cartier Tank Anglaise with diamonds and an automatic caliber begin around 93,000 USD. If the rectangular cases of the Tank and Santos collections don't speak to you, Cartier also offers watches with round cases. The Pasha pays homage to the Pasha of Marrakesh and is available in stainless steel for around 1,600 USD pre-owned in very good condition and around 2,900 USD new. In gold with a skeletonized dial and diamonds, a new model costs about 117,000 USD. Both versions feature an automatic caliber. While the men's watches in the Calibre de Cartier collection are also round, they are much more modern and sporty. The collection's name is not a coincidence: Its watches are powered by the first movement ever developed and produced by Cartier in-house. You can choose between a 38 or a 42-mm case, with the latter best suited to larger wrists. A never-worn model in stainless steel demands around 5,800 USD. A pre-owned version of the automatic Calibre de Cartier costs about 1,800 USD less. Cartier developed the Tank in 1917 during the First World War and brought it to market in 1919. The British's use of tanks at the Battle of Flers-Courcelette in 1916 was the first time tanks had ever appeared on the battlefield. The square watch's design was based on these colossal steel giants, and its lines are reminiscent of a tank's tracks. One special feature of the Tank was the design of its unique lugs, which were part of the case. The strap fits seamlessly on the Tank with no space between it and the case. Cartier presented the American General John J. Pershing with the first prototype. 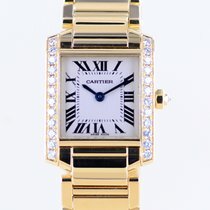 Patrons of Cartier quickly fell in the love with the watch, which has received numerous updates throughout the years. This has led to various submodels, such as the Tank Anglaise and the Tank Française. The latter is only available as a men's chronograph. Prices begin around 1,800 USD for the stainless steel version and go up to 2,700 USD for the bicolor edition. If you're a fan of Art Deco, you may enjoy the Tank Américaine. Compared to other models, its case has a rather oblong shape and feels particularly elegant. You can purchase a classic example in yellow gold with a leather strap for around 3,900 USD in mint condition. Plan to spend about 23,300 USD on the diamond-studded version of this automatic watch. The Cartier Santos has been around since 1904. The Paris-based company designed the wristwatch for the famous Brazilian pilot Alberto Santos-Dumont. In 1906, Dumont performed the first public engine-powered flight worldwide. During this record-breaking flight, he used the wristwatch Cartier designed especially for him. This meant he could keep both hands on the wheel while reading the time. The Cartier Santos is considered one of the first pilot's watches in the history of watchmaking. The rectangular shape and distinctive screws on the bezel are all characteristic features of this collection. Classic vintage models from the 70s and 80s demand around 4,100 USD. Cartier rereleased the Santos collection in 2018. These models feature the in-house caliber 1847 and can withstand magnetic fields of up to 1,200 Gauss. The manufacturer also updated the angular design of the bezel, which is especially prominent on the bicolor models thanks to their contrasting colors. A real advantage of the new series is its use of Cartier's patented QuickSwitch and SmartLink systems. These make changing out the band an easy process. You can get a new-edition Santos in rose gold for around 19,800 USD. Skeletonized models in stainless steel cost about 30,300 USD. The Cartier Roadster embodies the attractiveness of sports cars from the 50s and 60s. While it has much in common with the Cartier Tortue, it has been refined with some interesting details. For example, the screws on the corners of the pillow-shaped case resemble the headlights of a roadster, as sports cars were often called back then. Also, the cyclops lens over the date is made to look like the hood scoop of a car. Hood scoops allow air to flow directly into a car's engine compartment. Set aside around 2,100 USD for a quartz-powered Roadster in very good condition. For this price, you can get the classic version with a white dial and black Roman numerals. A more recent version with Arabic numerals and an automatic movement starts around 2,300 pre-owned and 4,100 USD new. The Ballon Bleu is round like a balloon. The crown of these women's and men's watches is set with a sapphire cabochon kept safe from damage by a protective arch made of precious metal. A cabochon is a gem that has been shaped and polished but not faceted. It has a flat underside and a domed surface.Expect to pay about 3,500 USD for a mint-condition Ballon Bleu. Pre-owned, this luxurious timepiece sits around 2,900 USD. 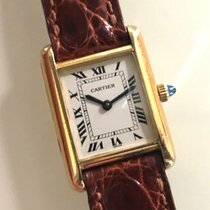 The French jeweler and watch manufacturer Cartier has history, tradition, and experience stretching back over more than 160 years. In 1847, 28-year-old Louis-François Cartier took ownership of the Parisian jewelry store run by his mentor, Adolphe Picard. Cartier established himself quickly with his Paris store. A large part of his success was due to his sense for the tastes of his customers. In 1874, his son Alfred joined the company. He expanded the watchmaking sector of the business with the goal of creating Cartier watches for the home, on necklaces, and as wristwatches. The Cartier store already had diamond-studded women's watches on display as early as 1888. With these wristwatches, Cartier proved themselves pioneers in the field. Towards the end of the 19th century, pocket watches were still the preferred method of telling the time. In 1893, the company ordered their first batch of watches from Vacheron Constantin. In the beginning, these early wristwatches didn't sell very well as they weren't particularly fashionable. However, as long sleeves and women's gloves became less popular, the naked wrist became the perfect spot for a wristwatch. Cartier's precious jewelry and watches were highly sought after by kings and nobles worldwide. They established themselves as the official jeweler of the largest royal houses, providing richly decorated tiaras set with gemstones to queens and princesses. Among their clientele were the Grand Duchess Maria Pavlovna of Russia, Queen Elisabeth of Belgium, and Queen Victoria Eugenie of Spain. This was just one of many reasons the Prince of Wales and later King Edward VII proclaimed the Parisian business the "Jeweler of kings, king of jewelers." This still holds true today; at her wedding to Prince William, Kate Middleton, the Duchess of Cambridge, wore a Cartier tiara that had been previously worn by Queen Elizabeth and Princess Margaret. The business split into three parts upon the death of Louis Cartier in 1942: Cartier Paris, Cartier London, and Cartier New York. 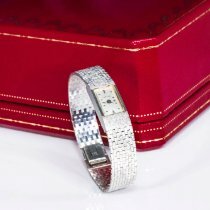 The parts remained separate until the end of the 1970s, when they were brought together as Cartier Monde SA. Today, Cartier belongs to the Richemont Group together with other manufacturers such as Vacheron Constantin, Jaeger-LeCoultre, and A. Lange & Söhne.